I have been trying to stop churning carriers to enjoy what I have and make memories in them. I am lucky that we have a really great local group of parents who I can do temporary trades with and am fortunate that I am able to have babywearing as both a hobby and a parenting tool. That being said, I don't want to devote too much time to looking at and chatting about carriers, and I really want them to be more about the function than the hobby. I try to be a good, present, parent, and find that being online makes for a large distraction away from nursing, nap times etc... when I could be doing other things. Why am I telling you this? Well... I just found out that we are expecting baby #3! I am so excited to have another child, and with that I have been reflecting on some of the choices I have made with my first two children. I don't want to be acquiring more things for this baby. Between carriers, cloth diapers, and clothing I truly have everything we will need (unless I need to splice some pink and purple into the mix). I don't want to spend as much time on the computer either. I will try to find useful hobbies (knitting, sewing, writing and yoga have been things I have been spending more time on lately). I want to truly be present when I am playing legos with my children, and not half-heartedly playing while browsing the swaps. Also, there is the monetary aspect of this. As far as collections go, this is not a cheap hobby. I am blessed that I can afford it, but I should be prioritizing money better. 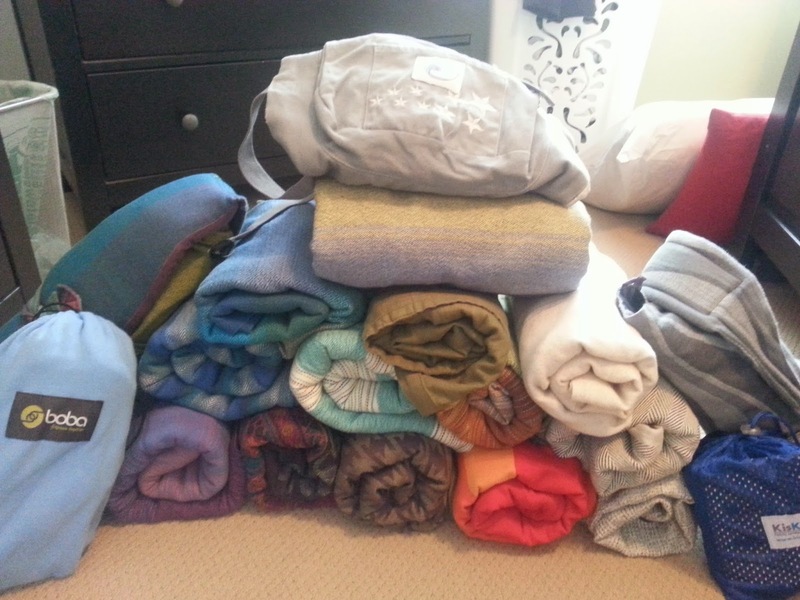 I have amassed 20 carriers, and plan to keep them until my babywearing days are done, making memories with each one. I have carefully planned my collection to suit all conceivable needs from birth to toddlerhood (I sometimes wear the three year old around the house, or for short walks home when tired little legs give out). When I am done wearing my babies *SOB* I plan to sell most of my carriers, and possibly keep some of the more sentimental ones, such as my customs, to make blankets, lovies, and scarves out of. That is more than enough. In fact, it is probably too much, but I want to wait to sell anything until I am sure I won't use it with new baby (chickpea is the working name). Wish me luck!